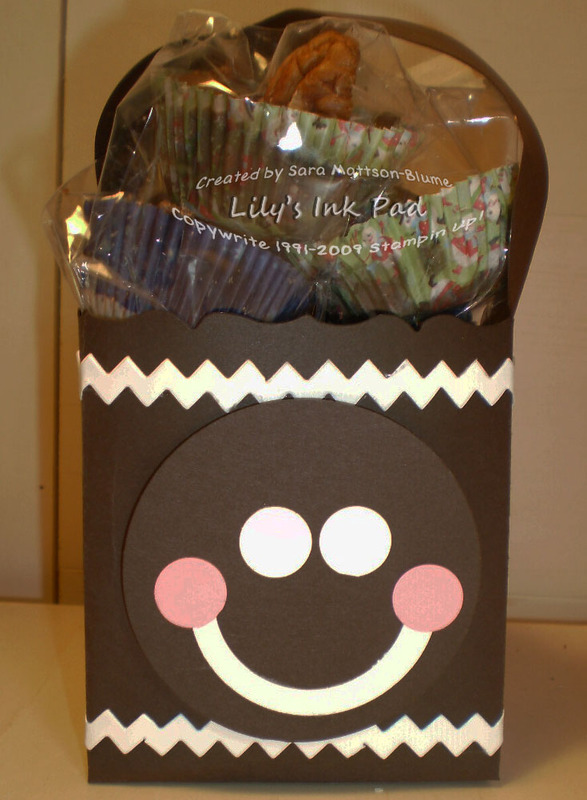 Lily's Ink Pad: Not Your Ordinary Cookie Exchange! I first saw this idea on a Demonstrator Only Idea Forum sponsored by Stampin' Up! called Stampin' Connection. Lisa Young created this using Crumb Cake. I was out of that, so I changed it up a bit! My "cookies" are my Grandma Leone's very special candies. I'll share that story at a different time. I have yet to finish the Cookie Exchange story. My sister and I (and Clare) left Shawano, WI, at 7 pm on Friday and got to our hotel at 1:30 ish am. Yep. Our 5 hour drive turned ugly at the Twin Cities (known to some of you as St. Paul/Minneapolis). We hit the blizzard. Yes, Blizzard. When newscasters use that term in Southern Minnesota, they mean it. Saturday am we woke up to Clare singing in her pack-n-play and looked outside to see nothing but whiteness. Good thing, Amy's house was like 10 minutes away. Try an hour. (We had to get some things at a store first like formula and baby wipes). We arrived and I unpacked the boxes of presents, the cookies, and Clare's stuff while my sister took Clare in. The snow was already over a foot. We had a great party...all made it safe and sound. When we left, we had to dig out, got stuck, had help from my uncle and Amy's husband Matt, and then worked our way to the hotel. We were within sight when the cement, I mean snow, held us up. Nic and I worked for about 45 minutes on moving about 20 feet when a Texan. Yes, a Texan named Nate who was a human snowblower helped us out. The transmission may have lost a few years, but we did get to the parking lot inside. Are you worried about 9 month old Clare? No need, she snoozed the entire time in her fleece, blankets, and car seat. Never knew anything was up! What a day! The good news is that we have some amazing bakers in our family and the shoveling allowed us to eat a few extra cookies that night! Sunday's drive back was pretty good--normal winter driving for us Wisconsin Girls, but did take extra long as Clare needed a few more breaks than on the way there! Love your cookie box! And glad you made it back safely. But hey, if you got stuck, at least you had the cookies, right? Can't believe you were driving around last weekend! Glad you made it safe! Your gingerbread man is too sweet! Love your container, though! So cute with that big smile on it. That story would make a good scrapbook page (or two)! Glad everything turned out well. Just gotta love that Minnesota weather!